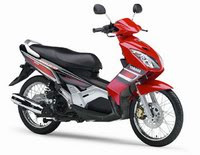 Harga Motor Yamaha Nouvo here is the average price of the Big City Like: Jakarta, Bandung, Medan, Surabaya, Semarang, Makassar, Denpasar from various stores and Dealer standard. As a pioneer of automated machines, Yamaha continues to develop high-quality motorcycles to compete with other manufacturers. For that, the Yamaha again kicked off the automotive world in the country with the launch of the Yamaha Nouvo Z in nine big cities in Indonesia. Yamaha Nouvo Z is for young people that are designed trendy and sporty. In addition Nouvo Z is designed to give comfort and to use automated machines to very easily driven. Yamaha Nouvo Z has a 4 stroke engine SOHC (single overhead camshaft). Also front and rear lights are designed sporty and has spacious trunk. Nouvo Z more sporty, alloy wheels are racing, the lights are aerodynamically.